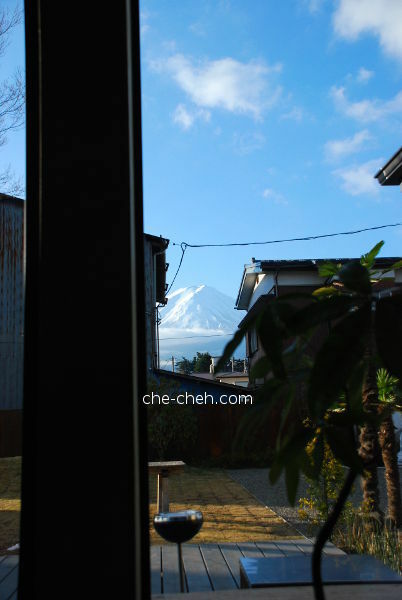 What’s the most perfect thing to wake up to when one is staying at Fujikawaguchiko? 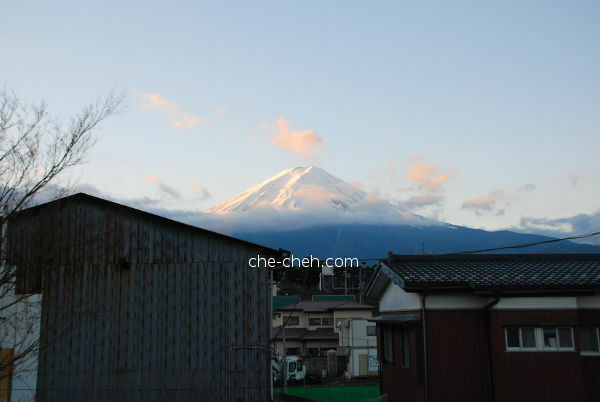 If you’re lucky like us, that means you get to admire Mount Fuji at dawn and sunrise. My initial plan was to go to Chureito Pagoda at Arakura Sengen Shrine before dawn and wait for the sunrise and view Mount Fuji. However, I cancelled it the last moment since it’ll be quite a hassle using public transport because the timing won’t match with our next agenda. 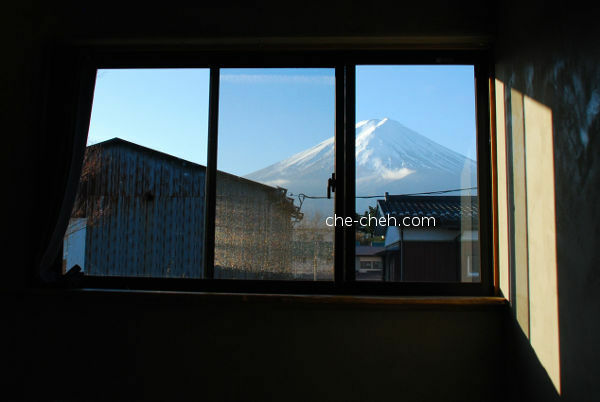 Besides, our rooms at Kagelow Mt Fuji Hostel has Mount Fuji view. So, it’s a win-win situation no matter what. When I woke up around 5.45am, the sky was still dark. 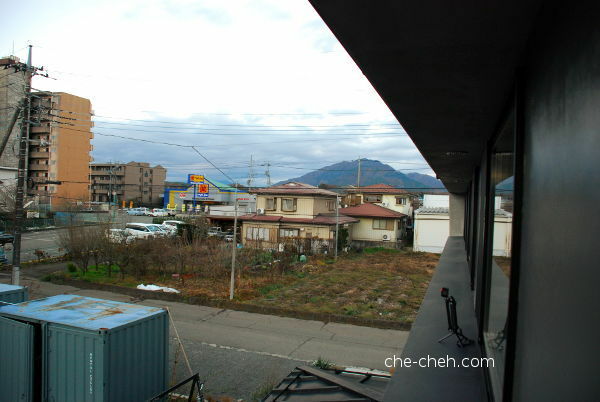 So, I went back to bed (slept on tatami), which is actually just beside the window. 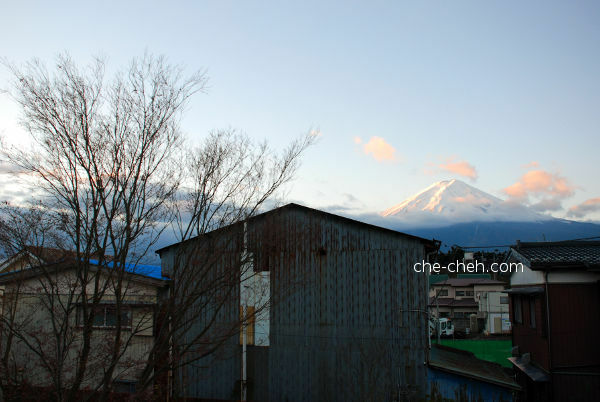 Then at 6am, Mount Fuji finally appeared! I quickly woke my sis and together we sat there, admiring this beautiful gigantic beast and of course busy clicking away. “Wahhh”, “Wowww”, “So prettyyyy”, “Oh my GOD”, “So so BEAUTIFULLLLLL” are some of the words that came out from my mouth. My heart was full looking at Fujisan. It was our lucky day. 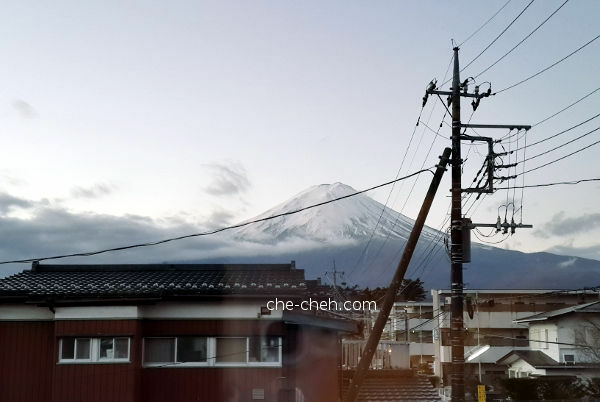 Mount Fuji view at different times (between dawn and after sunrise) taken from our room. 💗❤️💝💘 Ahh, the beginning of a PERFECT day! What more could I ask for? Nothing! This is perfect. The right view from the window of our room. The occupants beside us were filming Mount Fuji. Left view from the window of our room. Ours is the last room. 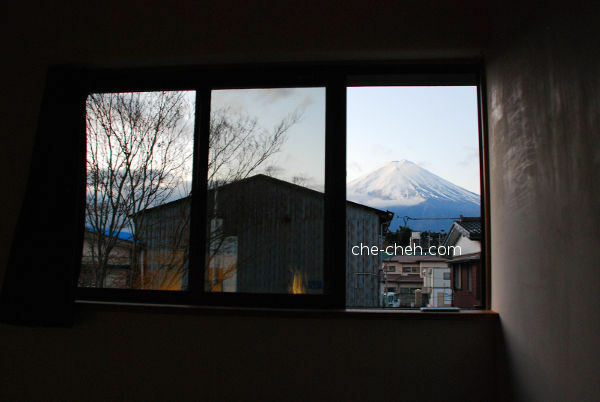 Front view from the window of our room at Kagelow Mt Fuji Hostel. Pinkish-red clouds colored by the sun (on the left, out of view). 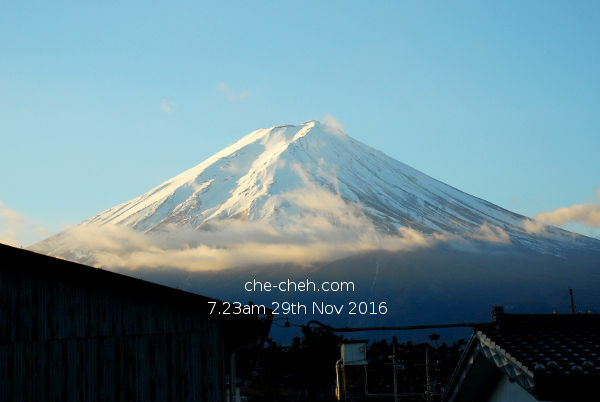 Zooming in at Mount Fuji at 7.23am. Mount Fuji view from No. 1 Queen Sized Bedroom. This was our mate’s room. Too bad about the pole. Spectacular Mount Fuji no matter what. Mount Fuji view from No. 3 Japanese Room Large. Mount Fuji view from No. 4 Japanese Room Medium. Mount Fuji view from No. 5 Japanese Room Medium. This was our room. 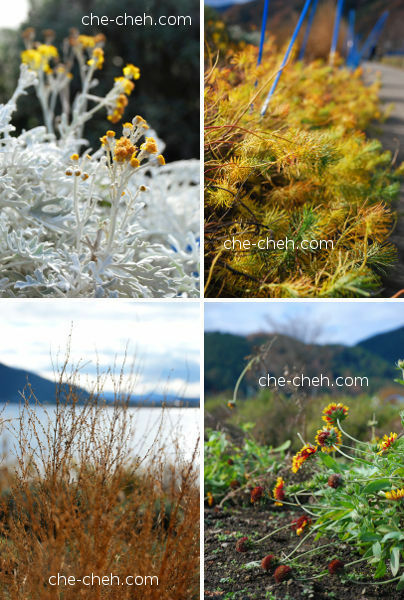 FYI, if you want to have higher chances viewing Mount Fuji, autumn and winter are the two best seasons. After that, we went to the lounge to have our breakfast which consist of bread bought the day before at Takadaya 高田屋. 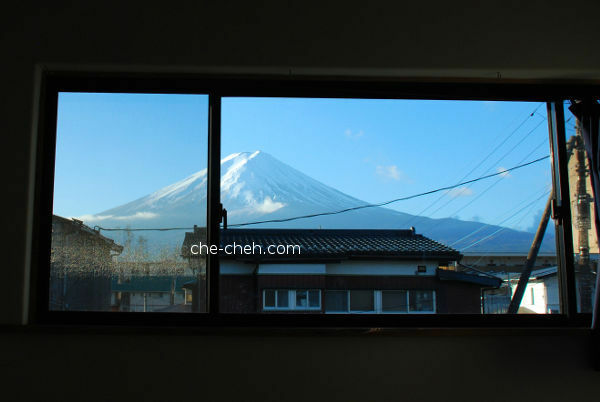 Mount Fuji view from lounge area. 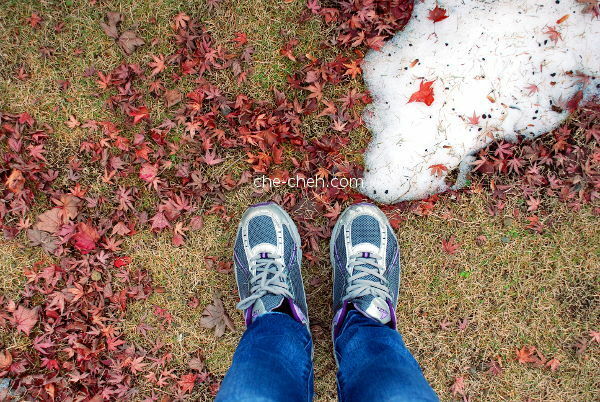 Today we find some snow left at the garden of our hostel. 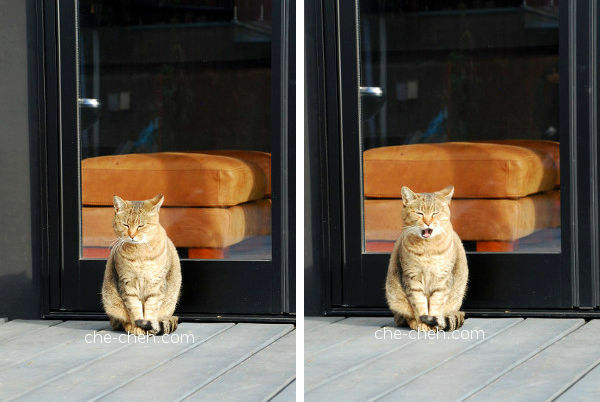 A cute kitty at our hostel. We checked out from the hostel around 8am+. We left the keys in a box at the reception and our luggage by the reception as well. Then we walked to Kawaguchiko Station. At the station (9.05am), we bought Red Line & Green Line 2 Days Ticket @ 1,200 yen pax. Yes, the gloves are needed. 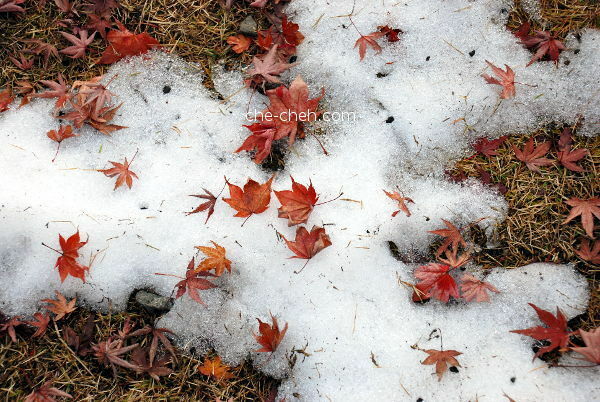 Very cold leh! With this we are able to get on and off the red line and green line sightseeing buses as many times as we want for two days (unlimited rides). Since, we’re leaving in late afternoon, you might think buying this two days ticket is not worth it for just couple of hours touring the lake. Oh, I can tell you it’s very worth it. Honestly, paying in accordance to the bus fare (based on our routes) are cheaper compared to the two days ticket BUT not by much. And the plus point is it’s super CONVENIENT!!! You don’t have to worry whether you have enough coins for the fare. And when the bus is full, just showing the 2 days ticket is much more easier and faster. 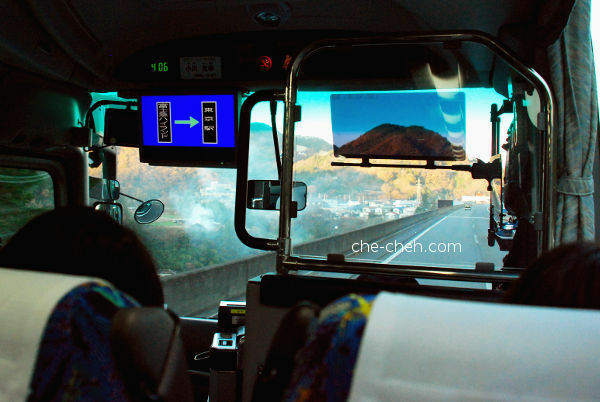 Due to time constraint, we only tour the red line bus around Kawaguchiko (Lake Kawaguchi). 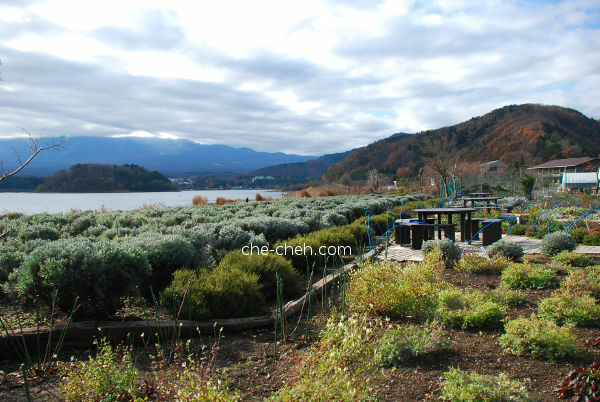 FYI, green line bus will bring you to Saiko (Lake Sai). 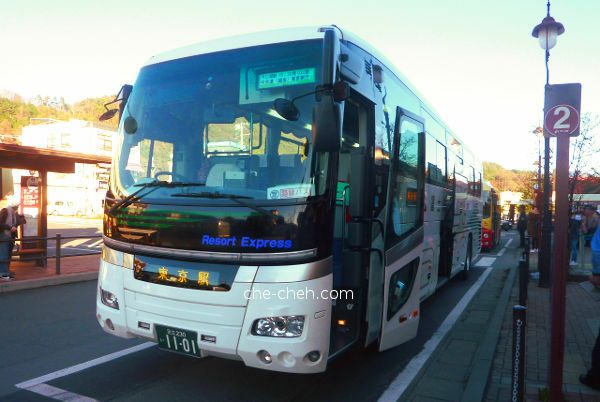 There’s also a blue line bus to bring you to Shojiko and Motosuko (two other lakes of the Fuji Five Lakes). 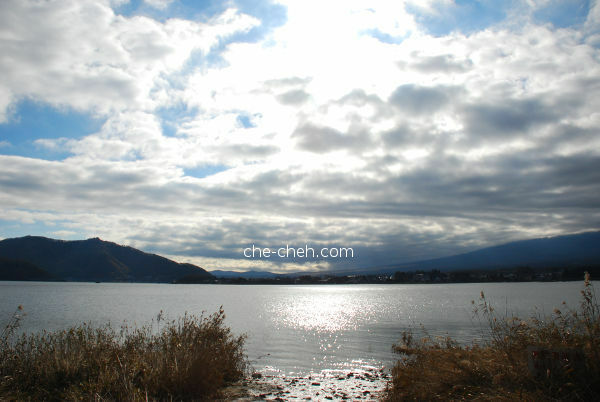 And for the last lake Yamanakako, you need to take Fujikko-go bus. 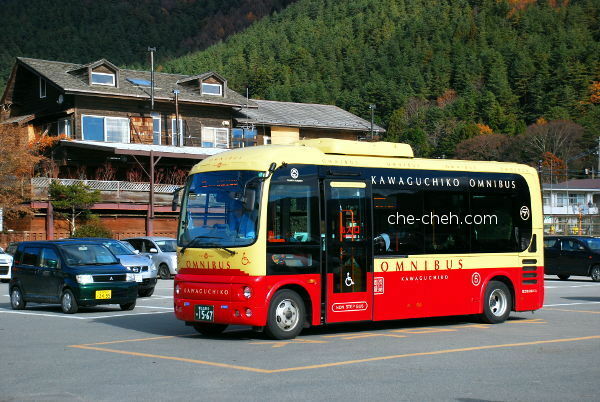 We took this cute Kawaguchiko Omni Bus to Kawaguchiko Natural Living Center 河口湖自然生活館 (Kawaguchiko Shizen Seikatsu-kan). It’s the last stop for the red line. Time was 9.40am. 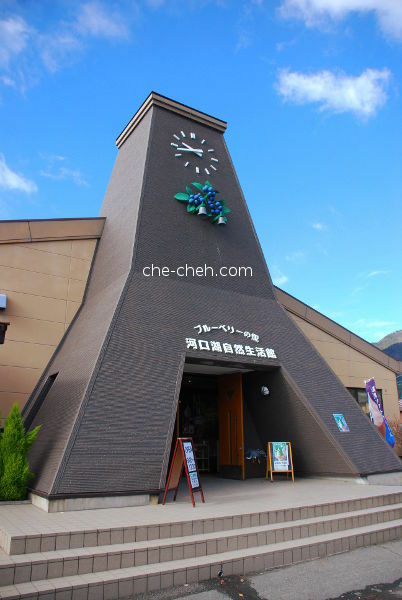 Kawaguchiko Natural Living Center 河口湖自然生活館. 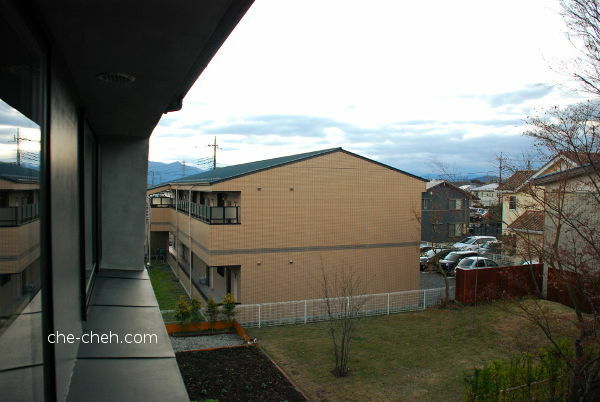 Our main agenda here is actually to view Mount Fuji. As it was hidden by the clouds, we spent some time in here after enjoying our time outside at Oishi Park 大石公園. Admission is free for both. 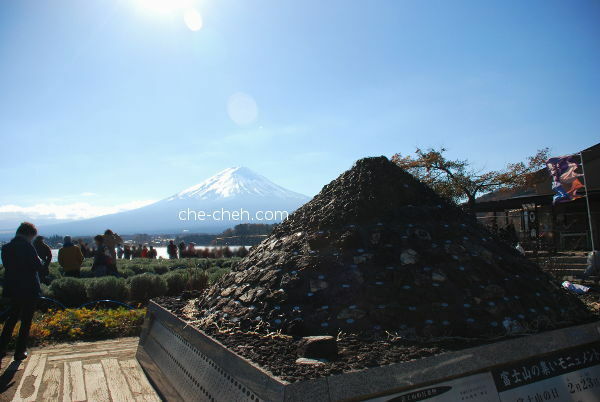 There are tonnes of Mount Fuji souvenirs in Kawaguchiko Natural Living Center and oh boy, we lugged quite a few home. There are also ice-cream, jam making, lavender products, cafe and most important of all: toilets. 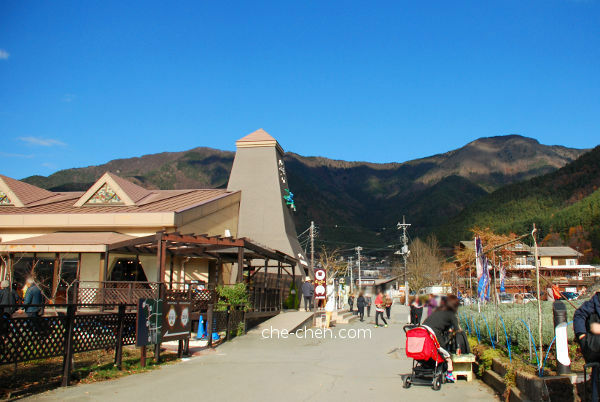 Kawaguchiko Natural Living Center 河口湖自然生活館 on the left and Oishi Park 大石公園 surrounding it. If you visit during summer, where lavender is plentiful in this park, you can bet Mount Fuji view will be really stunning. But then you also run the probability of not seeing the mountain because you need more luck to view Mount Fuji in summer months. It looks ordinary in this photo but to be there, in the presence of everything, it was stunning. See the branch on the left of the photo? 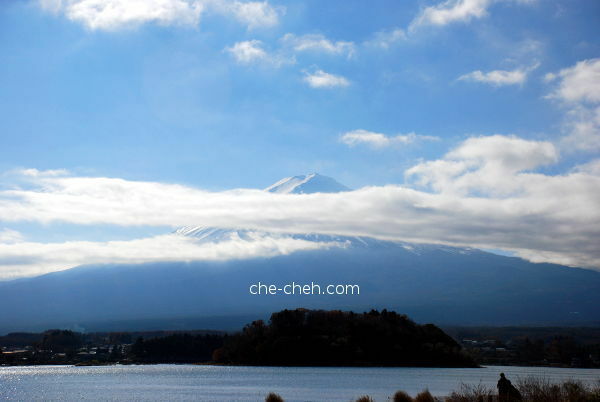 That’s where the clouds are hiding Mount Fuji. Saw these really cool buildings. 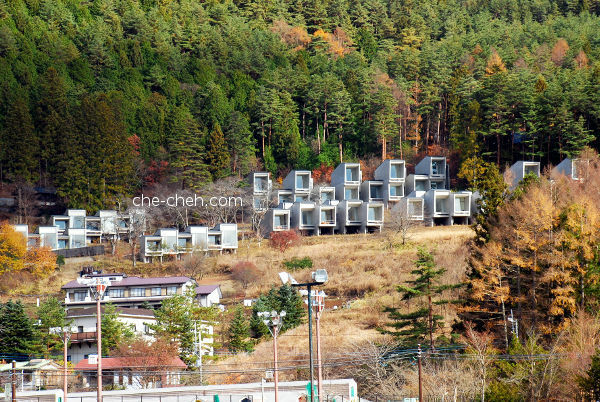 Turns out it’s a luxury camping resort called Hoshinoya Fuji 星のや富士. It’s super $$$. Kawaguchiko 河口湖 and Oishi Park 大石公園. 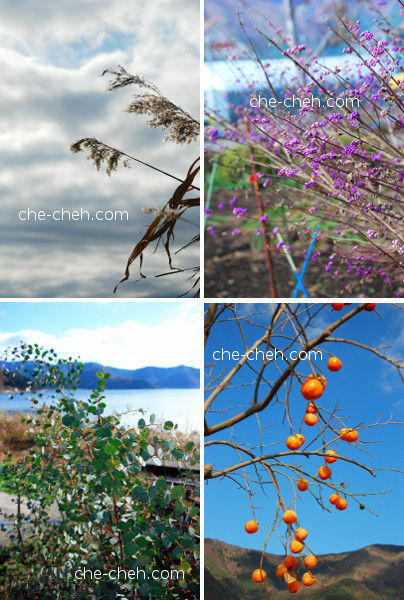 Nature’s magic at Oishi Park 大石公園. 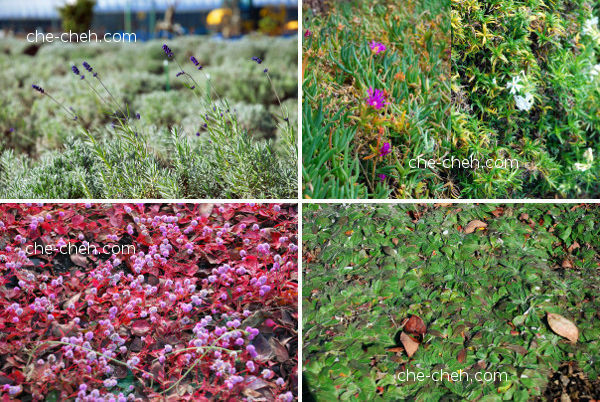 Some strong surviving lavender (top left photo)! 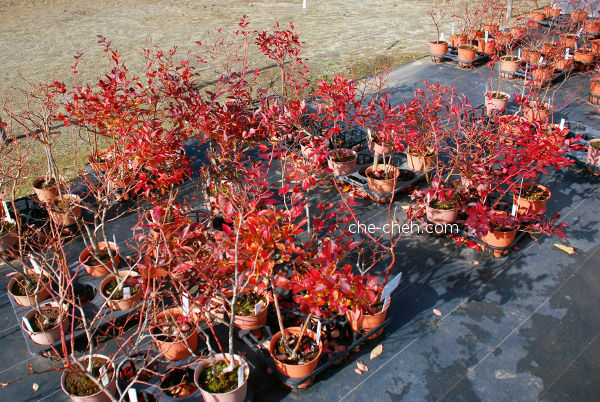 Plants for sale @ 1,100 yen per pot. Gah, I was so tempted to buy them but then reality woke me up. While we were half-way checking out the Mount Fuji goodies in Kawaguchiko Natural Living Center, Mount Fuji began to show itself. Time: 10.17am. We said to ourself, give her more time. She’ll reveal herself in full glory soon. And there we have it, Mount Fuji 🗻 at 10.47am in its truest form. How can I now fall for you? I do and I did every time you come into view! 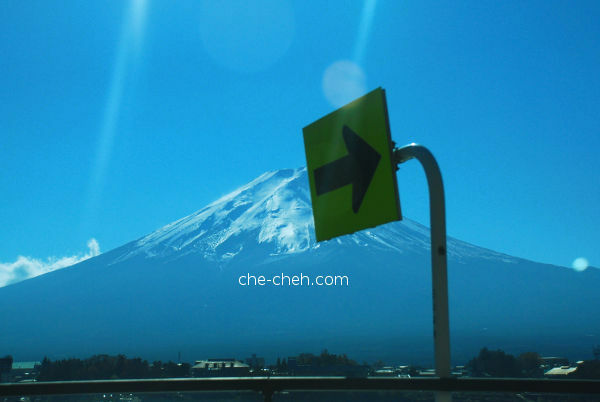 Why I love Mount Fuji? It’s just so breathtaking beautiful. It takes one’s breath away. And it’s so perfect in every way. Its almost perfect symmetrical form is a plus. 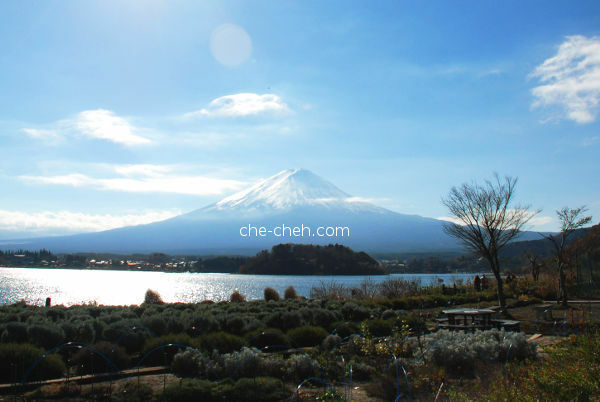 Oishi Park (+ Kawaguchiko Natural Living Center) is one of the best place to view Mount Fuji and here’s the proof. 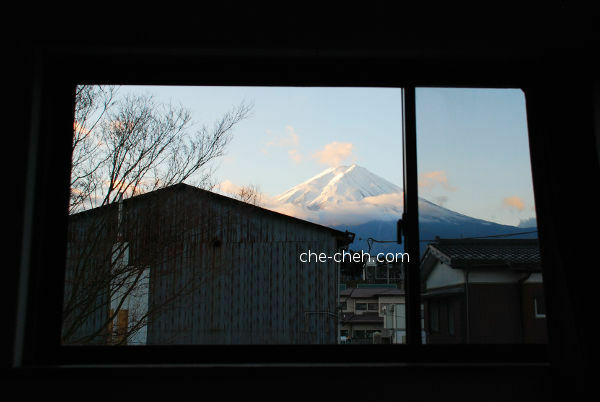 While the sunrise Mount Fuji view from my hostel room was stunning, this one here takes the cake. This was the best highlight of my Japan trip. 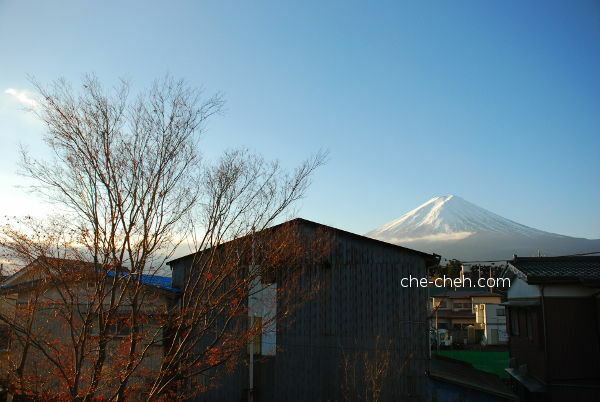 Only in autumn and winter (and perhaps spring) can you see snow cap Mount Fuji. I’m gonna conquer you one day! When everyone are standing there… looking, snapping and absorbing that moment of true beauty. 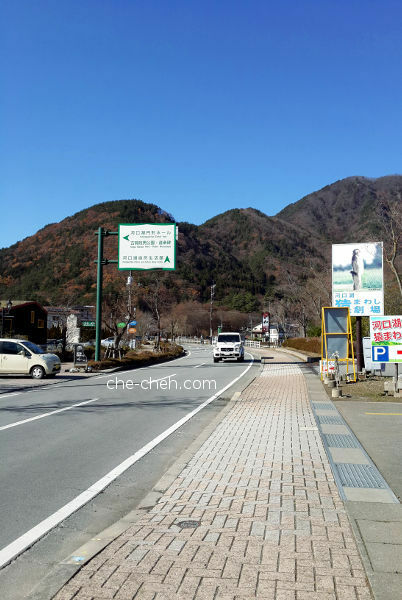 We spent an hour and the half at Oishi Park and Kawaguchiko Natural Living Center in total. We didn’t want to leave that place actually. Haha. We waited for the bus and then hop on to our next stop. Since it was near noon (11.15am), the bus is packed to the brim. I almost had panic attack in the bus. 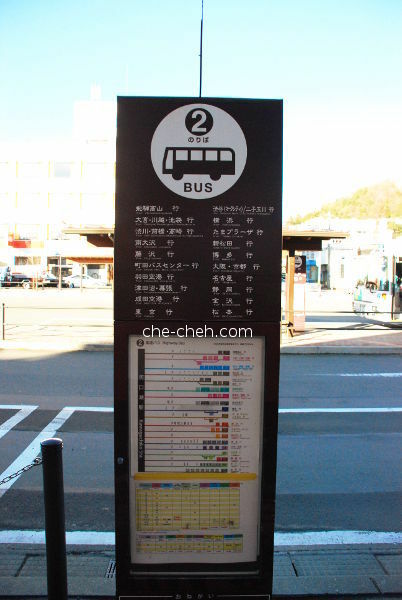 We disembarked at Itchiku Kubota Art Museum bus stop (no. 19). Actually we got off at the wrong stop. 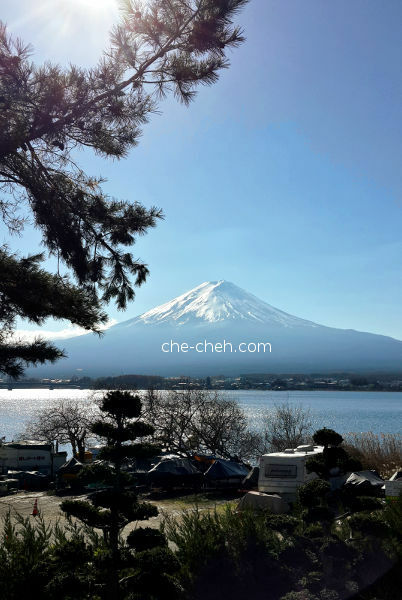 Thankfully we did that, for I will never know what it feels like to walk along Kawaguchiko (the lake) with Mount Fuji in its noontime glory. After our souvenir shopping at Kindaruma 金多留満, we waited right outside where there’s a bus stop (no. 18). Click the link to see this very special jelly we bought at Kindaruma. Again, the bus we got on was full. 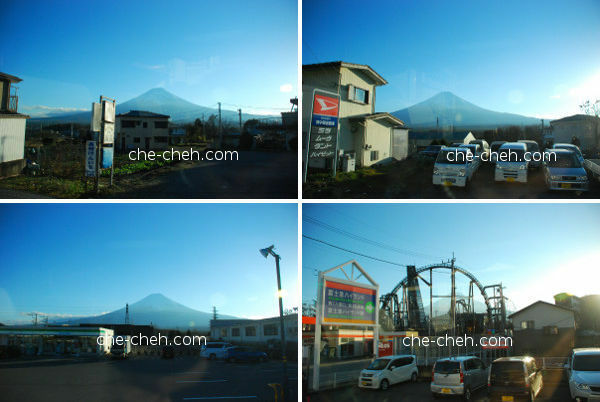 Mount Fuji and Kawaguchiko seen from bus. 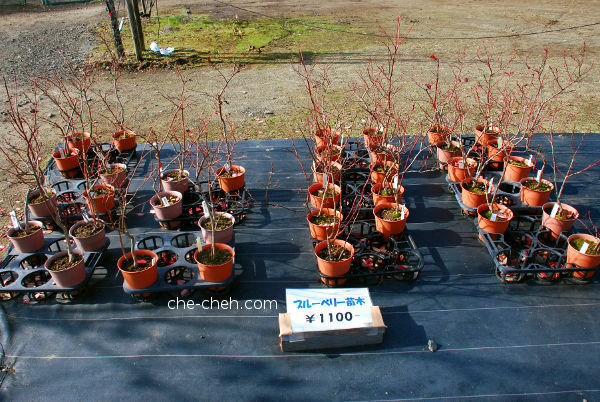 We wanted to visit Kawaguchiko Herb Hall next, but somehow we missed the chance to get down. We arrived back at Kawaguchiko Station. 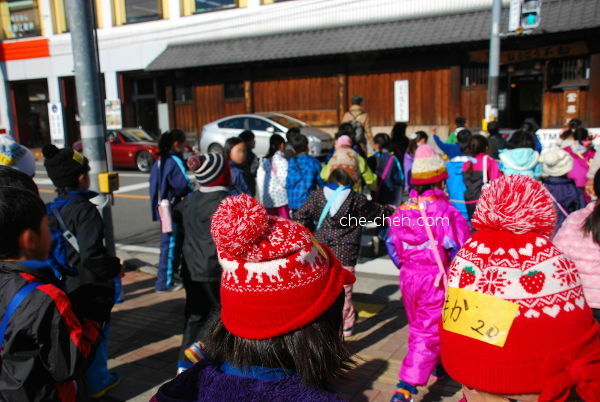 School children crossing the road in front of Kawaguchiko Station. We’re doing the same too. I love their some bright outfits. The wooden building in the photo is the fame Hōtō Fudō ほうとう不動 where we had a really yummy lunch. Click link to read my review. Still remember our day 8 misadventure with Hōtō Fudō? Yeah, we finally tried it. Yay! Hey there pretty one. Taken at 1.21pm after lunch when some of us where checking out souvenir shops nearby. 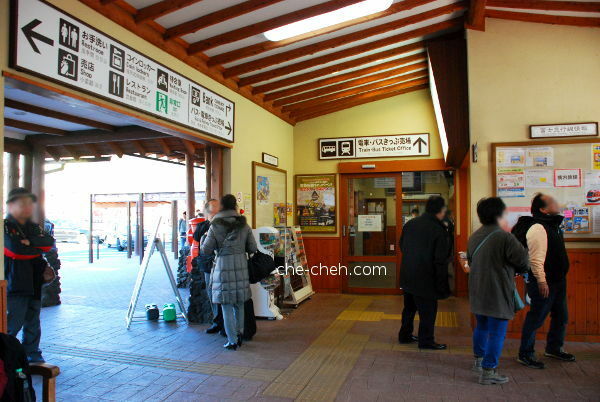 We then walked back to Kagelow to collect our luggage and brought it back to Kawaguchiko Station. We will be leaving Fujikawaguchiko for Tokyo. Meanwhile, while waiting for our bus bound for Tokyo in Kawaguchiko Station, I reconfirmed the bus stop number because I have a feeling it’s wrong. I was right. Mount Fuji view and train at Kawaguchiko Station. That’s public road go-kart (bottom left) taken outside the station. 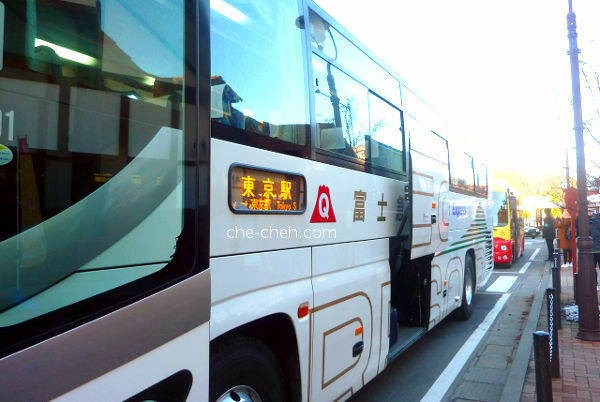 Our Tokyo bound bus will arrive at bus stop no. 2. That’s our ride to Tokyo. 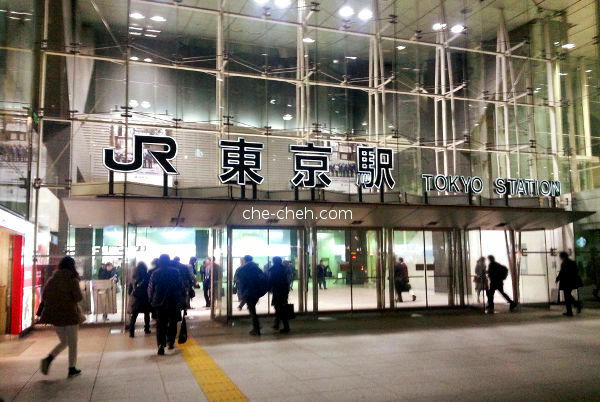 Our ticket fare from Kawaguchiko Station to Tokyo Station (Nihonbashi exit) is 1800 yen pax. We bought the ticket at japanbusonline.com prior to our trip. It’s a Fujikyu bus company, just like the one we took from Mishima Station to Kawaguchiko Station the day before. The bus departed on time at 3.30pm and were not full. It has even less commuter compared to the one we took from Mishima Station to Kawaguchiko Station. The journey will take 2 hours and 5 minutes. The good news is this bus has toilet. Leaving Fujikawaguchiko 😰 and Mount Fuji 😘 is still showing itself. 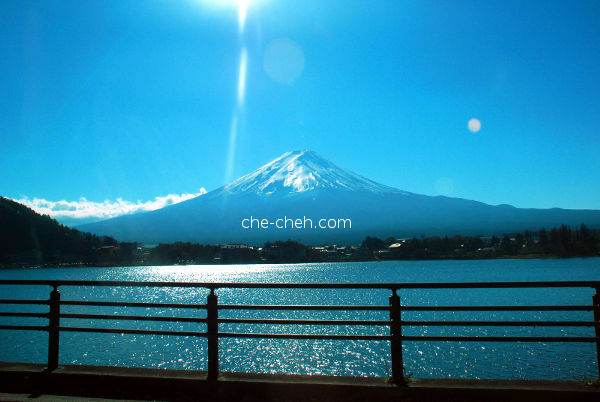 This indeed was a really lucky day for us as we were able to see Mount Fuji so many times. Super thankful for our good timing. I hadn’t had one in a long long while. 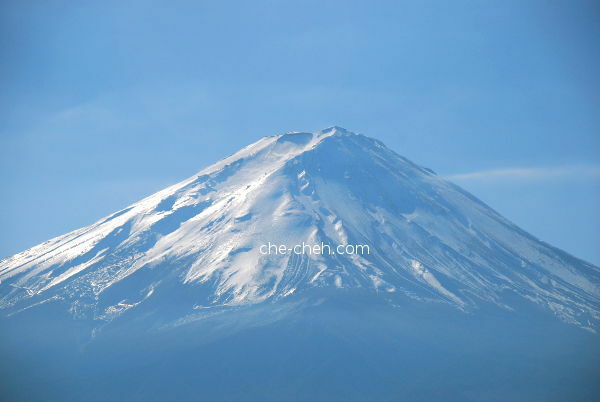 I promise I will be back Fujisan! Photo bottom right is the fame Fujiyama roller coaster and can you see Mount Fuji behind the roller coaster? This is one of the most scenic roller coaster you’ll ever ride! 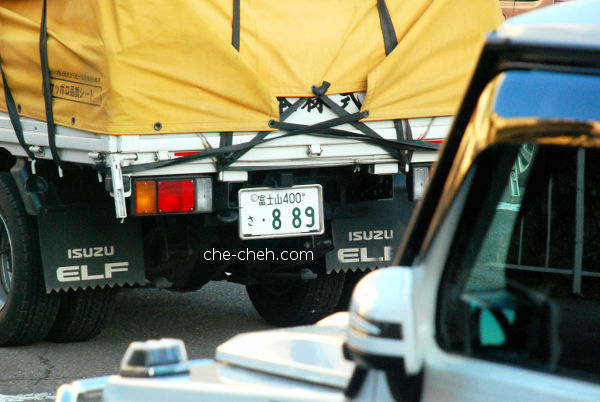 Car number plate with Mount Fuji name seen on the road. Before I book the bus ticket to Tokyo, I checked out the traffic situation around Tokyo area using Google Maps, and every time it’s red in color (highly congested). So I knew, our evening journey into Tokyo will not be a smooth one, since it’s peak traffic period. So, yeah instead of arriving at 5.35pm (as schedule), we arrived at Tokyo Station at 6.44pm, which is 3 hours 14 minutes later. Even before we got into Tokyo, we were already crawling very so slowly at the highway. And you know what caused the jam? Not accident. But bottle-neck!!! Quite a few of us went to use the bus’ toilet. Thank you for preparing this, mr bus company! The clever us also brought some snack (daifuku) for the bus ride. Tokyo Station. We’ve never been so glad to get off from the bus. I bet everyone’s butts were a bit sore by then. Some were standing (including me) at the last leg of the journey. Haha Again, the bus driver is 👍. Since we arrived quite late, my dinner plan at Nemuro Hanamaru (near Tokyo Station) had to be cancelled. Slowly, we made our way to our hostel, Nui via subway (using ICOCA card). After checking in, we quickly drop our stuff and went looking for dinner nearby as it was nearly 9pm. We had dinner at Yayoiken やよい軒, a Japanese teishoku restaurant. After dinner, we stopped by Daily Yamazaki to get our breakfast for tomorrow. Then it’s back at the hostel, shower and then sleep. It has been a long day 9 and was so happy how the day had turned out. Stay tuned for day 10 for our new adventures in Tokyo.